The AgentX++ C++ framework provides a complete AgentX protocol (RFC 2741) implementation that adds AgentX master and sub-agent support to AGENT++. AgenPro provies ready-to-use templates for the code generation for AgentX++ master and subagents. The Agent Extensibility (AgentX) Protocol allows independently developed sub-agents to communicate with a master agent running on an internet device. AgentX++ adds AgentX support for master and sub-agents to any AGENT++ SNMP agent. AgentX++ supports UNIX domain socket and TCP socket connections and includes a full implementation of the AgentX MIB (RFC 2742). AgentX++ needs multi-threading beeing enabled in AGENT++ for AgentX master agents. The supported platforms include Linux, Mac OS X, Solaris, cygwin, and Windows XP/7/8 (only TCP). In order to add AgentX support to your AGENT++ agent only a few lines of code have to be changed. 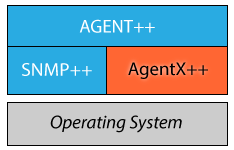 The necessary changes are shown in a AgentX master agent example and a AgentX sub-agent example. UNIX domain socket connections on UNIX systems. TCP connections on UNIX and Windows NT. Shared tables, including INDEX allocation. Atomic SET requests across multiple subagents. Seamless adding and dropping of connections and sessions. AgenPro a powerful code generator that supports round-trip engineering is also available for AgentX++.